Last fall, IBEW 1245 teamed up with IBEW 396 and our shared employer, NV Energy, to oppose Question 3, a deceptive energy deregulation ballot measure that could have had widespread impacts on utility jobs and customers in Nevada. Together, we soundly defeated the measure by a 2-to-1 margin – no small feat, considering the same exact measure had passed by a similar margin just two years earlier. The labor-management coalition we built played an enormous role in the success of the No on 3 campaign, and garnered the attention of the Edison Electric Institute (EEI), which this week presented the coalition with its inaugural Edwin D. Hill award during the National Labor Management Public Affairs Committee (LAMPAC) meeting in Washington DC on March 11. 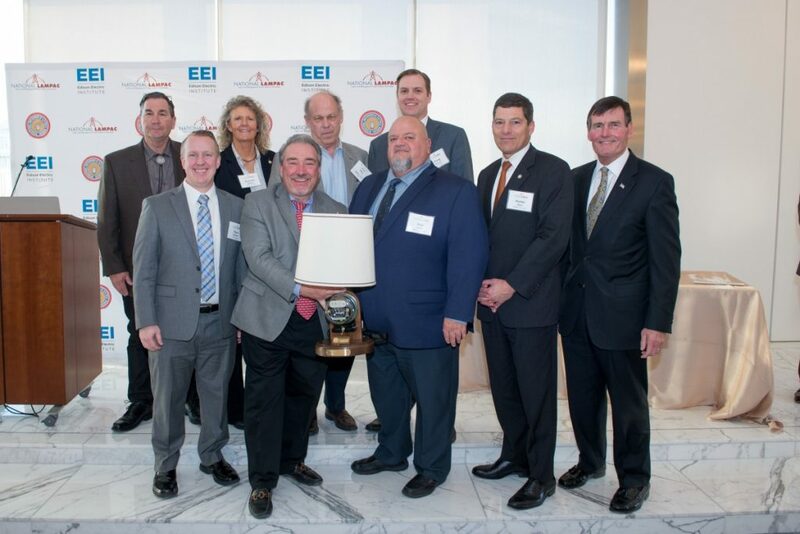 Named for IBEW International President Emeritus Edwin D. Hill, who passed away in December, the award is given to leaders who advance issues at the state and local levels. Hill, who EEI describes as “a transformative trade unionist who modernized and shepherded the IBEW through one of the deepest recessions in history,” built a legacy by establishing the IBEW as one of North America’s most powerful voices for working people. Hill also worked to create National LAMPAC in 2007 to help the union and electric companies jointly address the nation’s energy challenges. IBEW 1245 Business Manager Tom Dalzell, Senior Assistant Business Manager Bob Dean and Assistant Business Manager Hunter Stern represented Local 1245 at the awards ceremony.